Southend Makes Music is a concert comprising of several school music groups, primary and secondary & community Music Education Hub activities. A £1.50 per ticket booking fee applies, capped at four per order. Groups of 10+ please call 01702 351135 to buy fee-free. Fee-free for cash bookings. 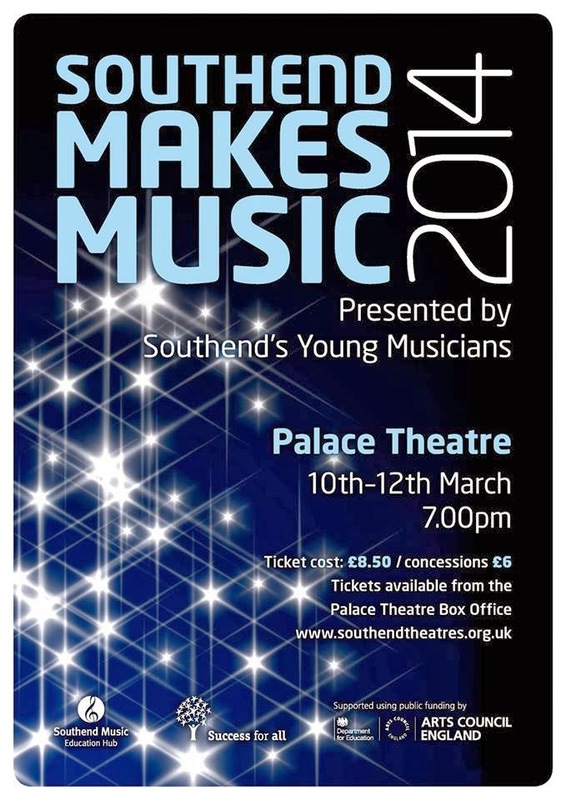 Young classical musicians from schools all over the borough will be showcasing their talents at the third annual Southend Makes Music festival over three nights in March. The festival provides a platform for young people to experience what it feels like to perform at a professional venue. Taking place at The Palace Theatre from March 10 to 12, each performance presents a variety of musical genres and ensembles including choirs, orchestras and bands providing primary children with the opportunity to watch the achievements of secondary students and vice versa. Southend-on-Sea Borough Council's Executive Councillor for Children and Learning, Councillor Mark Flewitt said in 2012 : "This is a tremendous event which has galvanised the talents of many young people, their teachers, and other musicians across the borough. "It has proved so popular that we hope it will become an annual event. Throngs of singers and instrumentalists will present two landmark concerts from 7pm on Tuesday 28th and Wednesday 29th February at the Palace Theatre, London Road, Westcliff. The performers include secondary and primary pupils from around 20 schools, and groups such as South Essex Youth Symphony Orchestra, Southend Girls Choir and the Original Woodwind Ensemble. This event, called Southend Makes Music, was the brainchild of Southend's Director of Music Services, Ros Pitcher, who also teaches at Southend High School for Girls. She challenged primary schoolchildren to devise lyrics based on the idea of - 'the future beginning with S'. As a result, youngsters - some as young as seven - from Friars Primary School, Shoebury; St Marys Church of England Primary School, Southend; and Eastwood Primary School, Leigh, leaped into creative action. Their words were set to music by local composers including Ros herself, as well as Andrew Palmer - the Head Teacher of Heycroft Primary School; Tracey Jennings, the Music coordinator from Eastwood Primary; Gerald Usher, who was previously Head of Essex Music Services; and Eric Withams, whose son, Andrew, is Music Coordinator from St Mary's Church of England Primary School. The secondary schools involved in the performances are Westcliff High School for Boys, Westcliff High School for Girls, The Eastwood School, Chase High School, Cecil Jones College, Shoeburyness High School, Southend High School for Girls, and Belfairs High School, Leigh.